I'm trying to use up last summer's bounty which I have left in my freezer. 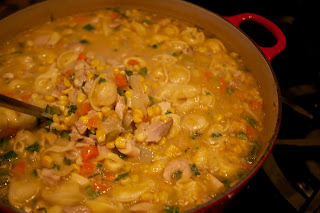 As I was rummaging through my stash, I found frozen corn, some tortellini and dark meat chicken. I only feed Winnie the white meat from the chickens I roast, so I always have frozen dark meat. I sauteed 1 onion, 1 diced poblano pepper, 2 diced carrots and 2 diced stalks of celery in a bit of olive oil. Once they softened, I added homemade chicken stock, about 8 cups and then added about 4 C. diced chicken, 4 C. corn and 2 large diced potatoes. I sprinkled in some dried thyme, S&P, 2 chicken bouillon cubes and 2 bay leaves. Let this simmer until the potatoes are cooked. Add 1 C. of milk and 3 C. of cheese tortellini. 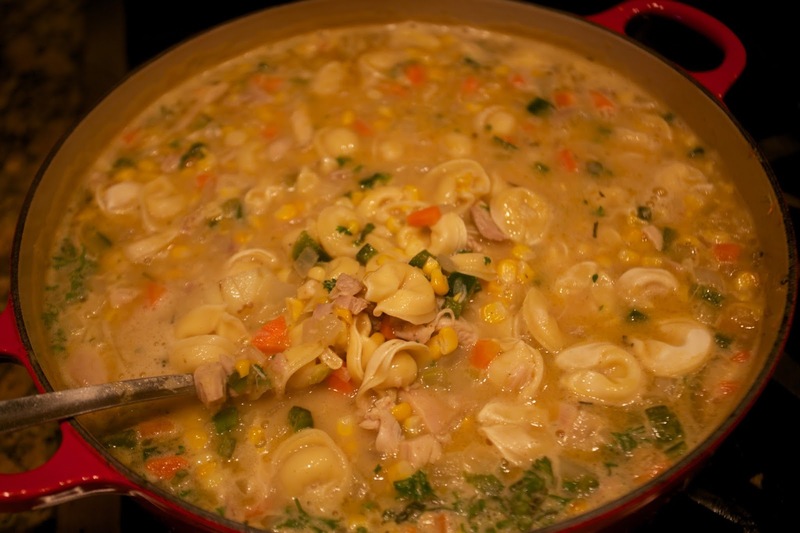 Simmer until the tortellini has softened. Sprinkle with minced, fresh parsley before serving. 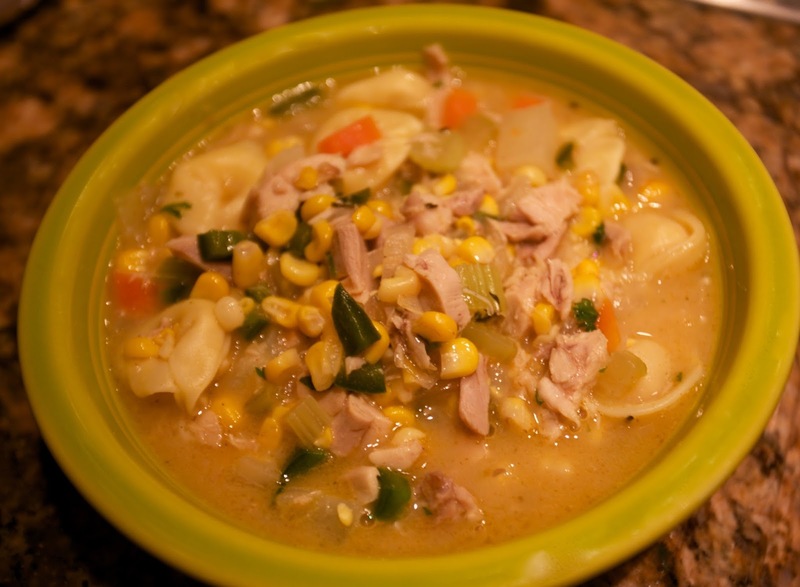 Using last summer's sweet corn really adds great flavor to this chowder. That sounds so good! I believe I have a few bags of corn from last summer lurking in my freezer - with this weather I tend to forget that spring and summer are not all that far off. I hope. May I ask why you only feed Winnie the white meat? Is it because it is more lean? oh that does sound good!!! It got cold Sunday so I cleaned out the freezer too. I made a really hearty beef and veggie stoup for dinner. I call it stoup because it started out like a soup but became a stew. It was comfort food and David loved it. It's a tad bit chilly over here and I sure wish I could have a bowl of that!